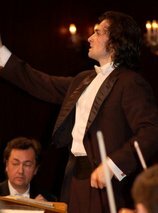 For the moment Cristian Sandu is Ph.D. assistant Professor at Orchestra and Opera Department at Cluj Napoca Music Academy and member in the organisation staff of ”Viva Vox” International Student Opera Festival. 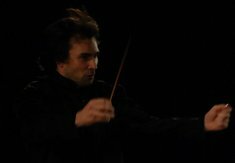 Also is main guest conductor of the Cluj National Romanian Opera in over 20 performances from Mozart to Puccini with tours in France, Suisse, Germany, Italy, South Korea. Abroad he has collaborated with Ukraine National Symphony Orchestra in Kiev (2006); movie soundtrack recordings „Growing toward the light” of the hungarian composer Aaron Fazakas; Kiev Radio Symphony Orchestra in South Korea’s Daegu International Opera Festival with Cimarosa’s Il Matrimonio segreto; ”Klassika” State Symphony Orchestra in Sankt Petersburg, Russia; Daegu Opera House Orchestra in Colombia, South America; “Bruno Maderna” Symphony Orchestra in Verdi’s Aida; Orchestra Sinfolario di Lecco (Bologna) and Dnepropetrovsk State Philharmonic Orchestra.